Did you know that in the winters, male caribou shed their antlers? Or that Arctic terns often opt to glide rather than flap their wings while migrating, so that they can sleep while gliding? Also, are you aware that a leatherback sea turtle often eats plastic bags, mistaking it for jellyfish and that this is a threat to their kind? 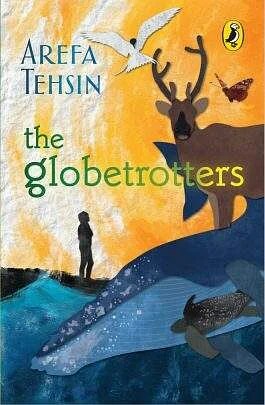 All this and a whole lot more information about the greatest migratory animals ever have been weaved into the narrative of Arefa Tehsin‘s latest book The Globetrotters. The book is essentially the story of two naughty bullies, Hudhud and Kilkila. Their mischief earns them a curse and they transform into animals like the blue whale, Arctic tern, caribou and a leatherback turtle in a quest to find answers to all the wrongs in the world. It also talks about the aristocracies of man meted out on the environment and aims to connect both children and adults to nature. “My father always told me that the best way to connect children (and adults) with nature is not through preaching and teaching, but through stories. Stories, like music, have the power to move, to change,” says the author and boy, are we glad that she chose this route to tell this story. Arefa, who was raised in Rajasthan, has always been in tandem with nature thanks to her wildlife conservationist grandfather and father. She was also appointed the Honorary Wildlife Warden of Udaipur and through the book, she talks about man and his relationship with nature. “The biggest injustice we do to nature is to think that Earth belongs to humans. Every little and big atrocity we do to the planet and its denizens stems from this amusingly egocentric belief,” she believes. What then is the easiest way to sensitise children towards the environment and its wildlife? Tehsin quotes Baba Dioum, a famous Senegalese forestry engineer to answer our question In the end, we will conserve only what we love, we will love only what we understand and we will understand only what we are taught.